Check at the bottom of this post for an explanation of what this is, and please enjoy the comic! Summary: A group of star imps attempt to take Nemo to Slumberland by turning his bed into a Chariot. Notes: Exact date unknown. This episode was not published in the US. 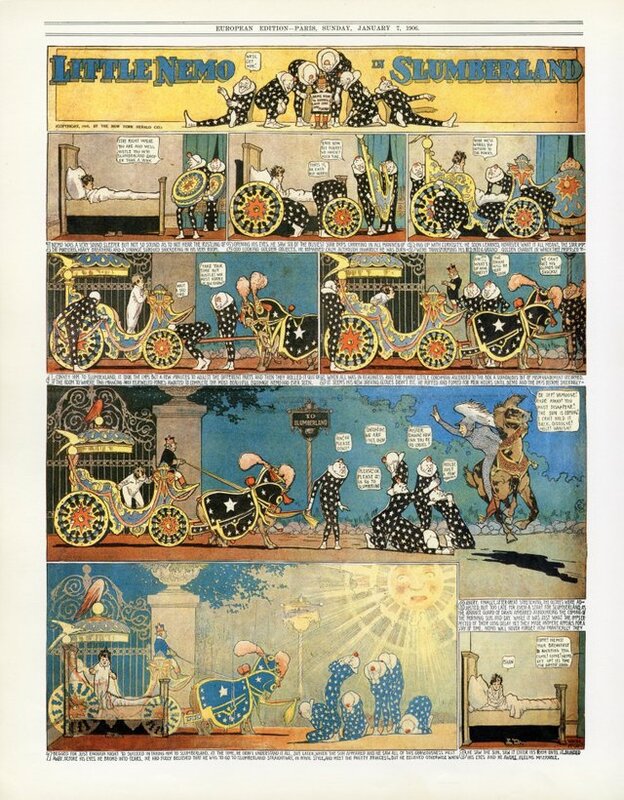 This is Little Nemo in Slumberland by American cartoonist and animator Winsor McCay. McCay is probably the most underrated artist of the 20th century. His work is absolutely gorgeous and magical aesthetically, not to mention he is one of the earliest artists to experiment with paneling in the cartoon form, making what we are today more accustomed to calling comics. The reason I'm posting his work here, and plan on doing so for a while, is because I think his work needs to not be forgotten. I'd also like to spread out access to his work, as it is quite obscure. These are also public domain because his work is so old, so it's a way of allowing me to continue updating my page here while I'm dealing with so many other things in my day-to-day life. I'll be posting transcripts as I can/when needed, as well, along with other meta data about each individual page. Please enjoy the work of Winsor McCay.